ScoreVision is excited to announce our live TV debut on ESPN! ScoreVision welcomed our newest customer, Oakland University, to the family over the 2017 holiday break and kicked off an exciting partnership with the January 5 men’s basketball game featured on ESPN. Oakland University is a D1 college in Rochester, Michigan. They replaced their complicated, outdated jumbotron system with a 40’ x 10’ LED jumbotron and four 10’ x 7’ corner scoreboards. All five jumbotron displays provide basic scoreboard functionality, plus they support a wide variety of alternative uses, including live camera feeds, video playback and a wide array of multimedia feeds. The ScoreVision software seamlessly supports digital ad delivery, so advertisers and sponsor ads run without intervention from the in-game production crew. The system is highly scalable and is capable of showing different content on each display or coordinating all five LED displays into one immersive experience called surround video. 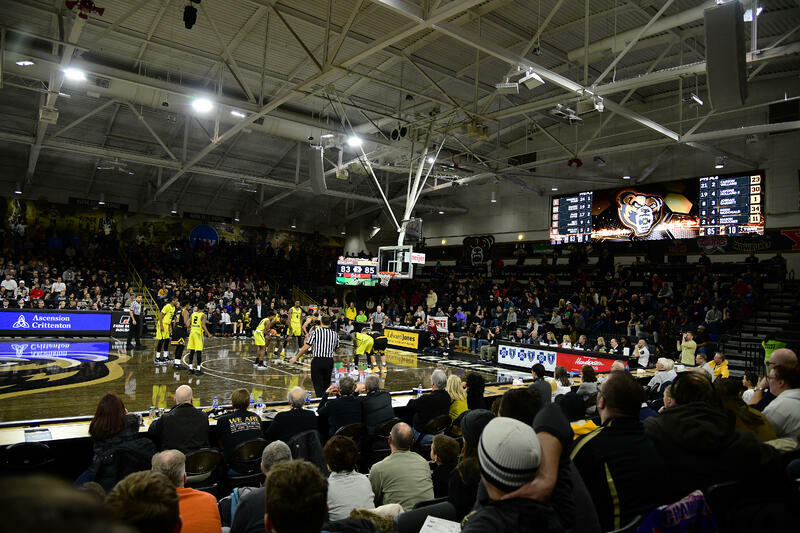 With a custom 3.8mm pixel pitch density, Oakland University’s new ScoreVision jumbotron system is one of the highest resolution LED systems in a college basketball facility in the country. Athletes and spectators were amazed by the crisp, vibrant imagery displayed whether you’re standing right next to the display or sitting on the other side of the arena. With over 4.3 million pixels, these jumbotron scoreboards convey an engaging game-time experience to fans of the Golden Grizzlies. ScoreVision’s Professional Creative Services Team developed a package of custom graphics and animations to give Oakland University an amazing first impression for their fans. Here are some of the production elements ScoreVision designed. Animated player profiles play during the starting lineup and whenever a player receives recognition for a great play. Animations like “Make Some Noise” and “Slam Dunk” are played to energize players and fans. This victory animation plays at the end of the game when Oakland University wins. 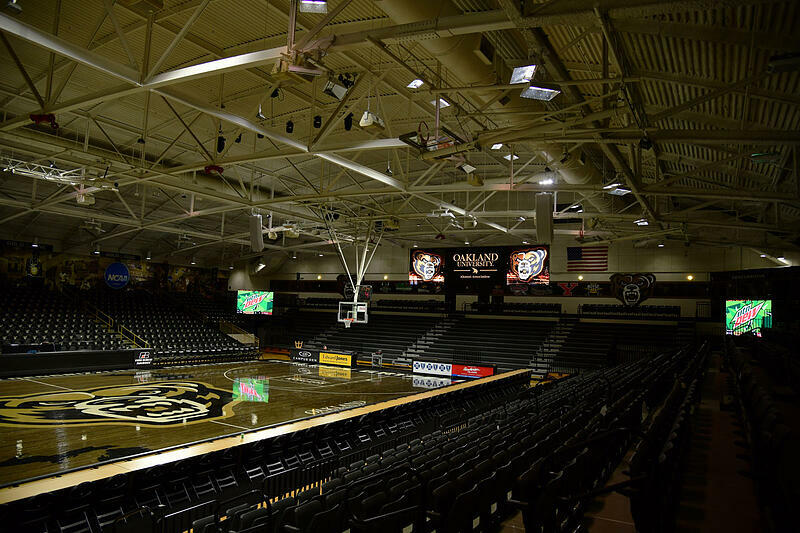 ScoreVision is excited to see how Oakland University continues to elevate the game-time experience for their fans in the O’rena. Stay tuned for more highlights and testimonials when we check in with the Golden Grizzlies next month! Follow us on Twitter and Facebook to be the first to know when we release new content. ScoreVision brings the professional arena experience to high schools, colleges, and sports facilities of any size with our affordable, easy-to-use jumbotrons and production software. Learn how you can bring ScoreVision to your school by contacting us today!